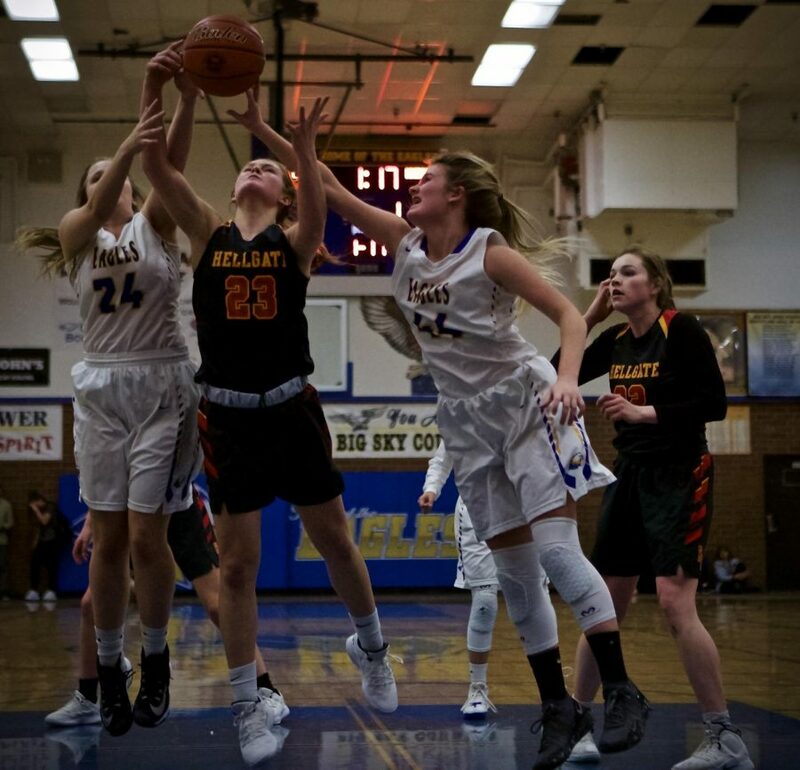 Senior Reagan Shoupe and Freshman Avari Batt attempt to block a Hellgate shooter at a home game where the Eagles fell 33-55. The Big Sky Basketball program has taken an interesting turn this season. Varsity basketball traditionally consists of seniors and juniors to create an elite team of athletes working together in order to reach success. This year’s girls Varsity basketball team is held up to the same expectations, but there is one apparent difference: three freshman are starters. The young athletes kept their ground and stayed on top with the rest of the players. The question that everyone is asking is, how did freshmen become part of the varsity team? In order to further understand the team dynamic we talked with Demi Smith, one of the freshman players. “It was scary at first but we worked it out in the end.” Demi touches on the fact that age does matter but in the end the girls worked well together. As a team the Big Sky girls preformed cohesively despite the age gap. Though there is natural authority in the seniors compared to the freshman, the girls treat one another as equal players rather the focus on their grade level. Why do players get put on the higher level teams in the first place? Football Coach Matt Johnson provides one explanation, “they just don’t have the numbers to have a full junior-senior level varsity program.” Because of the lack in numbers, younger athletes get better opportunities. Since Missoula kids can choose to go to different schools, the overall group of players diminishes in our high school. Because of the smaller group of players, the girls have a larger shot of getting on more accelerated teams. In conclusion, Big Sky has created a team of talented young players. Though the Girls have an age gap, the team worked as one rather than individuals. Big Sky is excited to see what happens next with our young athletes.